The original diagram can be found in Fig 2 of Hansen (2006) and the latest temperature data can be obtained from GISS. The red line in the diagram denotes the Surface Station data and the black line the Land-Ocean data. My estimate for 2008 is based on the first six months of the year. Scenarios A and C are upper and lower bounds. 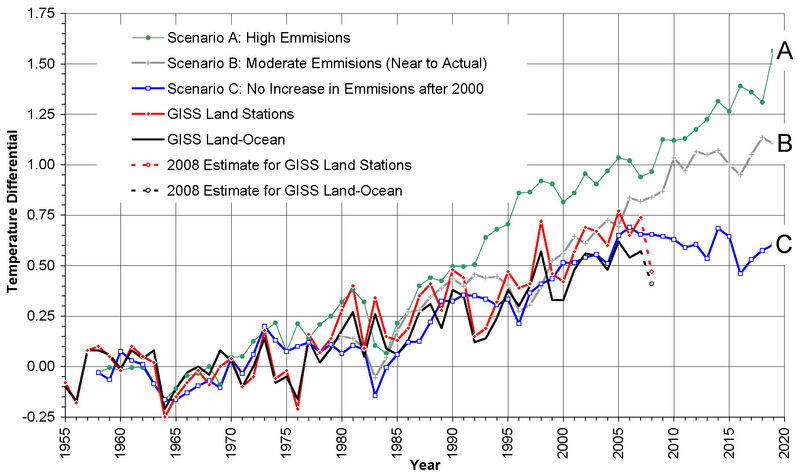 Scenario A is “on the high side of reality” with an exponential increase in emissions. Scenario C has “a drastic curtailment of emissions”, with no increase in emissions after 2000. Scenario B is described as “most plausible” and closest to reality. Hansen (2006) states that the best temperature data for comparison with climate models is probably somewhere between the Surface Station data and the Land-Ocean data. A good agreement between Hansen’s premise and measured data is evident for the period from 1988 to circa 2005; especially if the 1998 El Nino is ignored and the hypothetical volcanic eruption in 1995, assumed in Scenarios B and C, were moved to 1991 when the actual Mount Pinatubo eruption occurred. However, the post-2005 temperature trend is below the zero-emissions Scenario C and it is apparent that a drastic increase in global temperature would be required in 2009 and 2010 for there to be a return to the “Most-Plausible” Scenario B. Will global warming resume in 2009-2010, as predicted by the CO2 forcing paradigm, or will there be a stabilsation of temperatures and/or global cooling, as predicted by the solar-cycle/cosmic-ray fraternity? P.S: It would be very interesting to run an “Actual Emissions” Scenario on the Hansen model to compare it with actual measurements. The only comments that I can glean from a literature survey is that Scenario B is closest to reality, but it would appear that CO2 measurements are above this scenario, but unexpectedly, methane emissions are significantly below. Does anyone have the source code and/or input data to enable this run?